We’ll see you 270 metres above the river Tarn! Running enthusiasts will meet up on 27 May 2018 for an event that is of course sporty, but also festive! The Course Eiffage du Viaduc de Millau is a popular, accessible sporting event. The Course Eiffage du Viaduc de Millau, launched in 2007, is one of many events that involve bridges – Oresund Bridge, Verrazzano Bridge, Golden Gate Bridge, the Pont de Normandie and the Cheviré Viaduct, for example – but with one difference: the Millau Viaduct is the highest motorway bridge in the world, with a pier that rises 245 m from the ground. Review the results and retrospectives (in french) of previous events. 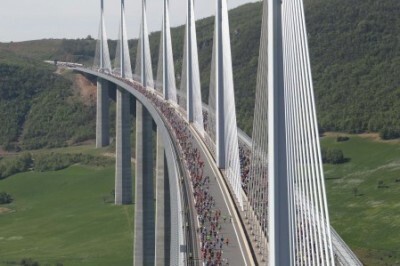 The Course Eiffage du Viaduc de Millau has become an important event in the world of running. You will be welcomed into reserved areas at the start (picturesque, where the old communal wash area is) and at the finish (stand and podium). You will climb aboard the Press bus to follow the race from the heart of the circuit and watch the ascent of the northern track and the turnaround on the viaduct from the south. Upon request, you will receive images of the event as seen from the sky, as soon as they are available.